MagicBands will be available for purchase next week for guests staying offsite at non-Walt Disney World Resort hotels. Advance FastPass+ reservations will be available to offsite day guests from 3/31/2014. Those guests will not be issued a MagicBand, but will instead use their RFID ticket media for touch to enter, and FastPass+. 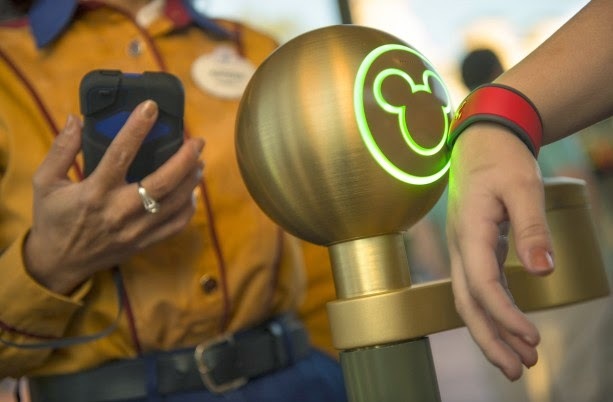 A MagicBand can then be purchased and will be linked to the guests My Disney Experience account and will operate in the same way as their RFID ticket media. The bands will not be eligible for touch-to-pay, which is currently only available to Walt Disney World Resort hotel guests. Offsite day guests will be able to make FastPass+ reservations for each day that is linked to their My Disney Experience account, starting 30 days in advance of the visit. Guests staying at the Walt Disney World Swan and Dolphin Resort will be able to make advance FastPass+ reservations up to 60 days in advance of their check-in date starting 3/31/2014. This gives those guests the same FastPass+ privileges as the Disney operated Walt Disney World Resort hotels. Swan and Dolphin guests will not receive MagicBands however, but they will be available for purchase at $12.95. The MagicBand is optional, as all FastPass+ and park entry can be done with the standard issue RFID ticket media. Touch-to-pay will not be available. Up until now, guests at the Swan and Dolphin have been making same day FastPass+ reservations at dedicated in-park kiosks staffed by Cast Members. You can now find Baby Cakes NYC doughnuts for sale at the Gardens Kiosk at Disney's Animal Kingdom. The kiosk opened last year, with the aim of offering allergy advice for the Animal Kingdom restaurants, and an assortment of special dietary food products. New parking fees price increases are now in effect at the four theme parks at Walt Disney World. Valet parking at the resorts has also seen an increase. New parking fees as of March 30 2014. The last increase was in June 2013 which saw a $1 rise to $15. Many guests do not pay parking fees, as resort guests automatically get complimentary parking. Most annual passholders also receive free parking as part of their pass benefits. Offsite guests using single or multi-day tickets will mostly be impacted by the rise. Valet parking has increased to $20 at the Walt Disney World Resort hotels. It was previously priced at $15. Self parking at the Walt Disney World operated hotels remains complimentary. Moana Mickey's Arcade is now closed at Disney's Polynesian Resort. It is not clear yet if the closure is permanent, or for a refurbishment, however the video game area closed 3/30/2014. Arcade areas remain available for guests to use at the nearby Grand Floridian and Contemporary Resort hotels. Disney's Polynesian Resort is undergoing major changes to accommodate the addition of the Disney Vacation Club Villas at the resort. Closures of Captain Cook's, the main Nanea Volcano pool, and extensive changes to the lobby are all set to begin soon. Tickets are now on sale for the 2014 Night of Joy, a special ticket event at Magic Kingdom Park featuring the top names in Christian music. Here is the full line-up for the 2014 Night of Joy. The Diamond Horseshoe at the Magic Kingdom is opening for quick service lunch beginning 4/1/2014 for family style table service dinner later in the month. Later in the month, the restaurant will be open for table service family-style turkey dinner. Reservations are required, and service dates are 4/13/2014 4:30 to 9:30 PM, 4/14/2014 - 4/17/2014 4:30 to 8:30 PM, 4/18/2014 4:30 to 9:30 PM, 4/19/2014 4:30 to 8:30 PM. Star Wars Weekends 2014 will bring two new Star Wars character dining experiences to Disney's Hollywood Studios. Start your day with the “Star Wars” Dine-In Galactic Breakfast! at the Sci-Fi Dine-In Theater Restaurant. Breakfast at the Sci-Fi Dine-In Theater Restaurant will include classic Star Wars movie characters and scenes from the films. “Star Wars” Dine-In Galactic Breakfast characters may include Darth Vader, Stormtroopers, Jawas, Greedo, and Boba Fett. For dinner from 4pm, the Hollywood and Vine has been transformed into Jedi Mickey’s “Star Wars” Dine at Hollywood and Vine where Mickey, Minnie, Donald, Goofy and Chip and Dale have all come together to celebrate the greatest saga ever told. Both of these new character dining experiences will be offered daily, and not just on Star Wars Weekend days, from 5/4/2014 through 6/15/2014. Yon can make reservations now by calling 407-WDW-DINE. For guests on the Disney Dining Plan, both experiences will require 2 table service credits. No discounts of any kind are available. The price of the “Star Wars” Dine-In Galactic Breakfast! experience is $47.99 for adults and $29.99 for children. The Jedi Mickey’s “Star Wars” Dine at Hollywood and Vine experience is $55.99 for adults and $33.99 for children, or as part of the “Fantasmic!” Dinner Package at a price of adults $59.99 and $36.99 for children. Both experiences include a digital photograph, and prices exclude tax and tip. The line-up for the 2014 Sounds Like Summer Concert Series at Epcot has been released. As always, performers are subject to change. Show times are 5:30, 6:45 and 8:00 PM – except on July 4 when show times are 5:15, 6:30, 7:45 and 9:00 PM. Sounds Like Summer concerts are included with Epcot admission and take place at the America Gardens Theater in World Showcase. 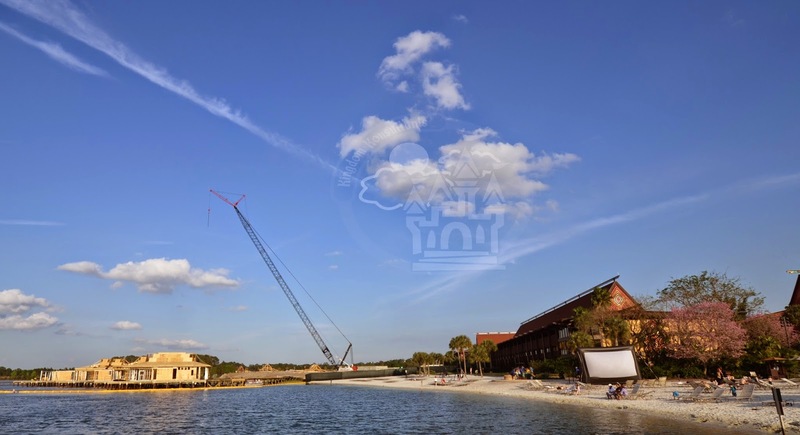 Just in time for the upcoming busy spring break and Easter period, both new ferry boat docks serving the Magic Kingdom are now complete. A second ferry boat dock has been added to both the Transportation and Ticket Center and the Magic Kingdom, which now allows simultaneous load and unload of two ferrys at either dock. have all of the necessary components in place to begin service.